The Veneto region of northern Italy is home to one of the major wine producing areas of Italy - Valpolicella, which literally means "valley of the many cellars". Just like Chianti in Tuscany, the Valpolicella is divided into "classico" and "non-classico" as a result of the expansion of the original region over the years. 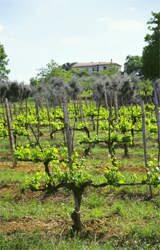 In Valpolicella it is the slopes of the valley that were the original "classico" site of cultivation. Later vineyards that expanded onto the valley floor are referred to as "non-classico". 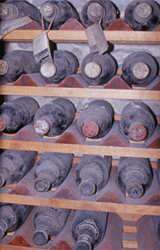 It is true that in the past, correctly oriented, well-drained hillsides produced superior wines, although it is arguable with modern viniculture techniques if this is as relevant today. 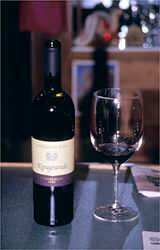 The two main varieties of wine produced here are the self-titled Valpolicella and it's more refined relative Amarone della Valpolicella. Both wines are made from 3 main grape varieties that I suspect are not that familiar to most readers - Corvina, Molinara and Rondinella. Also it is possible within the DOC regulations to add up to 15% ( in total ) of Rossignola, Negrara, Trentina, Barbera or Sangiovese. Valpolicella is classified either as the everyday "normale" or if the wine is well made with an alcohol content around 12% and allowed to age in-bottle for a least 1 year it attains the "superiore" classification. Amarone has a richer character than its' cousin and is made in a very labour intensive way by first allowing the grapes to dry on bamboo racks for up to 4 months to concentrate the flavours after which they are pressed and left to ferment in wooden barrels. Because of the need for perfect bunches of fruit and the amount of labour involved, Amarone is relatively expensive and is to the Veneto what Chianti Classico is to Tuscany or Barolo is to Piedmont. While doing research for our Sojourn in Italy tour which will be introduced in the 2007 season I had the enviable task of sampling examples of all of these wine varieties and in their own right they were all delightful. Valpolicella with its smooth youthful character and the intensity and complexity of Amarone. Both are especially suited to rich meat dishes and game.